A faster start.me has finally arrived! Millions of users already use start.me to make their browsing experience more efficient. In order to prepare for future growth and to keep up with user demands for faster loading times, we’ve decided to invest in a complete rebuild of the start.me frontend last November 2017. We’re happy to announce that we’re now ready with the rebuild and that we’ve migrated our first users today. We expect all users to be migrated by July 16. Read on to find out more about this major update. 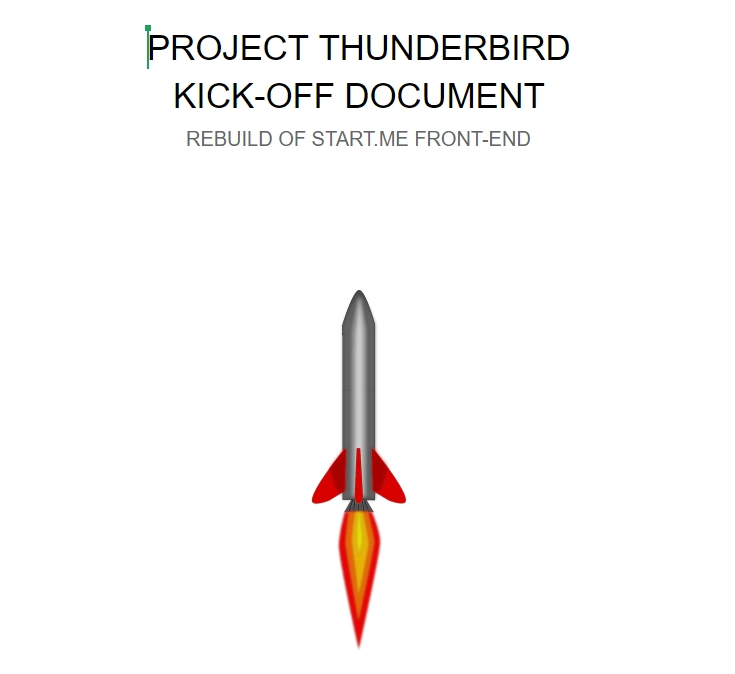 Cover of the original Kick-off Document to get to a faster start.me. We started working on the most important release of our product with one singular objective in mind: more speed. We already knew we had built a very useful and versatile tool, and many users agreed. But some of them really felt it just wasn’t fast enough to make it their default startpage. We heard you. We don’t want any functional or design changes, we just want the site to become super fast. After describing this very clear goal, we also decided there was only one real objective here: the user experience must come first. Instant information, no more loading and waiting for start.me to appear. It had to be responsive: usable on all browsers, on all platforms and devices. We wanted it safe: served via HTTPS to prevent snooping. Also: easy and free to use. In short: we wanted start.me to deliver the instant experience, without losing even one of our features. We’ve completely rebuild start.me from the ground up, fixing dozens of bugs and making just as many minor improvements along the way. In our next blog, we will illustrate them more in detail. The biggest leap forward we expect from implementing a new technology to render pages within a Single Page Application. By also adding caching layers, we managed to reduce the transfer of bytes over the internet, further reducing network time. Switching between start.me pages should be instant now. It’s like we’ve just put a whole new engine in your car. It’s got the same look and feel, but it moves a lot faster. Next week we’ll provide a detailed changelog of all the feature changes and bug fixes that are included in the new release. One major change that we want to share here already: in the new frontend, you can access the preferences for your account a lot faster, by clicking the user icon (top right corner). The second option gets you straight into the preference pane. Click the movie below, if you want to see it in action. When will my account be migrated? Today we’ve migrated our first users and we expect to have everyone migrated by July 16. If you don’t want wait to make the switch, please e-mail us at support@start.me and we’ll migrate your account with priority. What do I need to do to migrate? Nothing at all. We’ll automatically upgrade the application in the background and the next time you visit start.me you’ll be using the new frontend app. How will I know if my account has been upgraded? You should be able to feel the loading difference immediately. When you open the user menu (click user icon in right top), you will also notice a version number (version 2.0) in the bottom of the sidebar. Once you’re migrated, do you notice any difference in loading speed? Also: did you come across any bugs? We would love to hear your feedback. E-mail us at support@start.me or leave your comment in the section below.